How the heck does Santa get to everyone’s house so quickly? For years we’ve been told it was with his sleigh and the reindeer. But little did we all know, it was actually because he was on his Harley! This year Harley-Davidson has released a resin ornament of Santa on his ride as he’s off delivering the presents to all the deserving boys and girls. 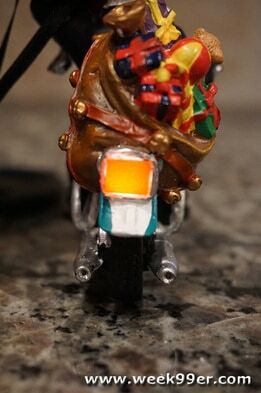 Harley-Davidson sent us one of their LED Resin Biker Santa Ornament to review this year. The biker Santa ornament is full of details from his flowing beard, tipping hat and bag full of presents waiting for him to deliver it. The bike is a classic Harley with a large spotlight on the front, painted teal with chrome accents. But the details on Santa and the bike aren’t the best part of the ornament. If you flip the Santa ornament over there is a small switch on the bottom to turn it on and off. The large spot light on the front as well as the tail light on the bike both light up with LEDs that change color as Santa rides through your tree. 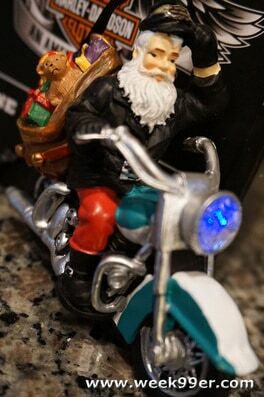 The Biker Santa Ornament is a great gift idea for the biker or Harley-Davidson fan in your life. We love the ornament and Santa will be a welcome addition to our tree this year. Harley-Davidson wants one of my readers to have a Biker Santa Ornament of their own. Read how you can win one below! Enter to win with the form below. 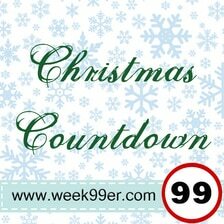 The mandatory entry is leaving a comment on this blog post telling me: What is your favorite Harley-Davidson Holiday Item? Or Who would you give this to if you won? If you do not do this entry – you will not win! So make sure you leave a comment and then enter using the form below! Custom Holiday Ornaments Review and Giveaway! Previous Chia Pets, Chia Seeds, and Muppets – Oh My! I would get thte large snow globe. I would give it to my Dad as he loves Harley’s. Thanks for the chance! I would give this to my husband if I won. He’s a rider. I would give this to my brother in law, who is the biggest Harley fan ever. I love this Santa ornament the best, or the boot ornament. They have a good selection for the biker in your life. I would give this to my brother. He loves riding! I would give this to my hunny!! I know he would love it!! I’d get this for my dad. If I won the Harley Davidson ornament, I would give it to my husband, who would love to get a Harley…but we won’t go there. I would give this to my dad because he just loves his motorcycle. I would give this to my mom!! I would give this ornament to my oldest son who is a big Harley fan and hopes to own one soon! If I won I would give this to my husband, he would love this! I would give this to my bike riding brother! I love the Fair Isle Stocking! I think each of us need one for Santa to fill :)! I’d give this to my office-mate if I won. Santa Cookie/Candy Jar is my favorite. I would give this to my sister’s boyfriend. He traded his beloved Harley for a down payment on a house. I would give this to my hubby who is a Harley rider ALL the way!! I like the Fair Isle Stocking and matching hat. 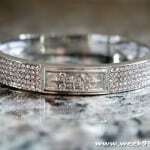 I would give this to my fiance’. I like the 2014 mini snow globe. I would give it to my best friend’s dad. Gotta say I love the santa ornament myself. I have the Harley Davidson Christmas lights hanging in my office. I’d give it to my cousin. I would give this to my cousin, a Harley rider. I would give the ornament to my friend who rides motorcycles. i would give to my husband cause he is the harley guy, i think i would pick a plain red or black ball with the harley sign on it. simple but perfect enough. I would give this to a friend who is obsessed with Harley Davidson items. 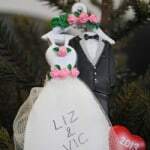 If I were to win this giveaway, then I would give this ornament to my husband. I like the LED Gas Pump Ornament. Would be a gift for my brother,the Harley dude in the family. 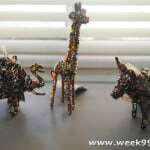 I think I would love to give this to my new hubby but save it for next Christmas and surprise him with it. I would give this to my son. He would really like it. i would give this to my brother in law who recently purchased a harley. I love the set of glass balls. I would give them to my dad. I like the Black Bar & Shield Ornament! I would give this to my son, he owns a Harley and would love to have this for his tree. I love the Holiday Tree Skirt. I would give this to my Harley riding momma. I would give this to my uncle, he loves Harley. 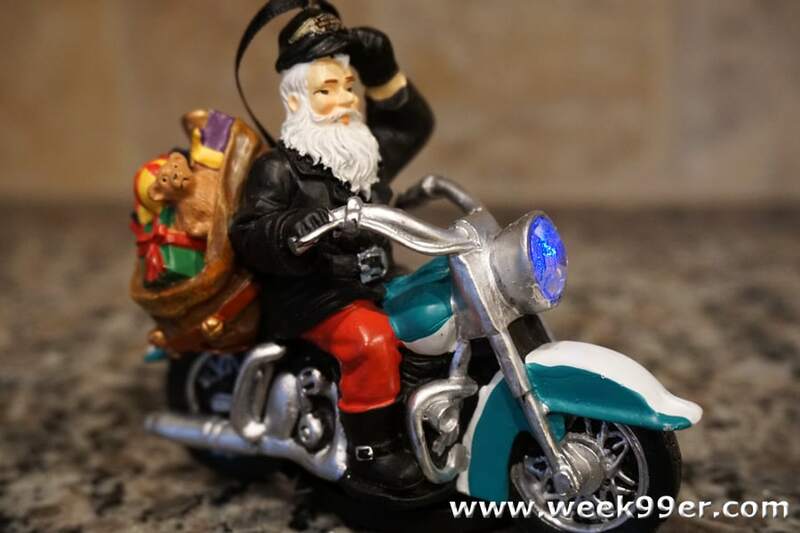 My favorite ornament is THAT one – the Biker Santa! I would give this to my girlfriend..she loves motorcycle stuff. My father in law loves harley davidson! I love the LED gas pump ornament. I would give this to my son. A huge Harley fan, and owner! I collect Nutcrackers so the Nutcracker Ornament Set would be awesome to have!